Orchestral conductor Henry Wood (1869-1944) nicknamed the pub "the Gluepot" because his musicians got "stuck" there too long during intervals of the concerts in the nearby Queen's Hall at 4 Langham Place (which was destroyed by bombs in 1941). Eventually he arranged for a man with a handbell to summon them back to the hall. Poet Louis MacNeice was punched in the mouth by fellow poet Roy Campbell here in a literary dispute after the second world war. With admirable self-control MacNeice stauched the blood with a silk handkerchief and muttered: "There is no need to behave like that, Campbell." They then bought each other pints and became firm friends. Just after the second world war one of the guests of the Brains Trust radio programme failed to turn up on one occasion. 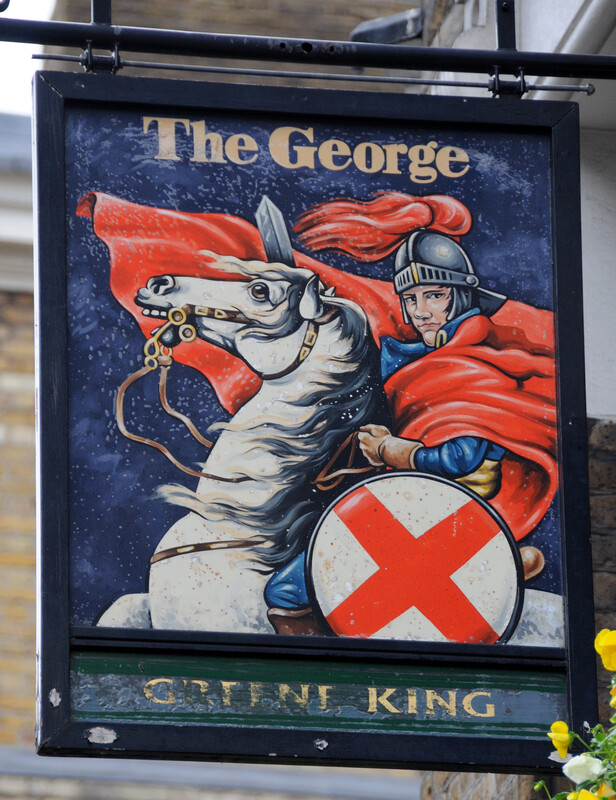 The producer at Broadcasting House was desperate for a replacement so went to The George looking for volunteers. Michael Arton, a painter and sculptor who lived in All Souls’ Place stepped forward and saved the day. The pub dates back to at least 1826. Among the people I saw and spoke to in The Gluepot during many long evenings in the ’50s were William Empson and Julian Maclaren Ross. I met the producer Rene Cutforth there and he recruited me for one of his radio series, thereby setting me off on a long career in broadcasting. Dylan Thomas was another regular (before my time) and the Behan brothers, Brendan and Dominic. The manager of The George was then Martin Sweeney. a feisty guy who cashed our cheques in the days before ATMs. It was said that one evening Brendan Behan misbehaved and Martin leapt over the bar and shouted “Will ye shut up Brendan or shall I have to spill yer guts all over the bar?” Behan slouched out and never returned.